Learning to DJ has never been easier than with the DDJ-400 2-channel DJ controller for rekordbox dj. 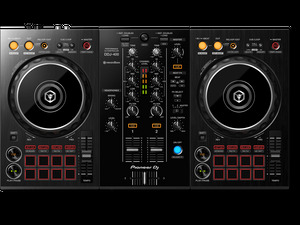 Packed with features to help you comfortably develop your skills, this controller�s layout mirrors that of our flagship NXS2 set-up, with shared elements like dedicated cue buttons, Beat FX, CDJ-style looping controls and more. As a result, our advanced DJ gear will feel natural to use when you�re ready to progress. Bundled with our professional performance software, rekordbox dj, its compatible Tutorial feature will help you master this controller's creative capabilities. Lightweight and portable, take the DDJ-400 with you to practice sessions or parties. You�ll soon feel at home while performing.